Today we sit down with designer, Helen Griffin to chat about her brand new line, Simply Made Crafts! We do a quick Q&A where we talk about her crafting background, her Simply Made Crafts line, favourites, and also some tips for how to design for magazines. Simply Made Crafts is Helen Griffin’s first product line and features a collection of dies, stamps, stamp/die combos, as well as paper pads, and accessories. There are two collections in the product line, Traditional Christmas for all your festive makes and Winter Nights to get you through Christmas all the way to Springtime crafting! We’re loving the Simply Made Crafts product line, but I think what we’re most excited about is all the dies*! They’re perfect for creating off the page projects, boxes, and gifts just in time for the holiday season. Add these dies to your stash to create beautiful handmade gifts that are easy, elegant, and will make an impression! (*Most of these dies require die cutting machines with a platform wider than 6 inches, like the Big Shot Plus). PS. Helen also joined us on the Craftstash Facebook Live Show for live giveaways and a couple of demonstrations last Friday. 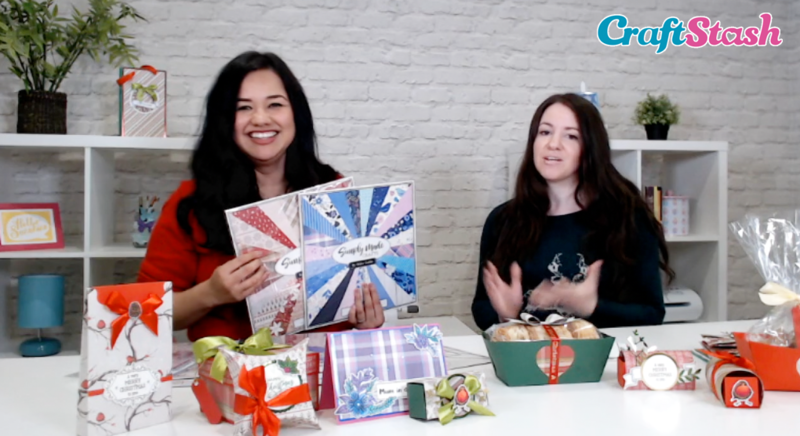 You can watch the replay here and take a look at all the beautiful creations she made using her Simply Made Crafts line (plus there’s 3 demos)! See the full Simply Made Crafts line exclusively on Craftstash.